Sit, One, originally uploaded by bill kralovec. Serbian President Boris Tadić last week called for early presidential elections for May 6th. The campaign posters have been coming out in force and from time to time, I’ll be blogging about the campaign and elections. Below is another for candidate #5, our old friend Tomislav Nikolić. The former radical, hunger striker, is now trying for presidency for a fifth time. Maybe it is a sign that he is candidate #5. 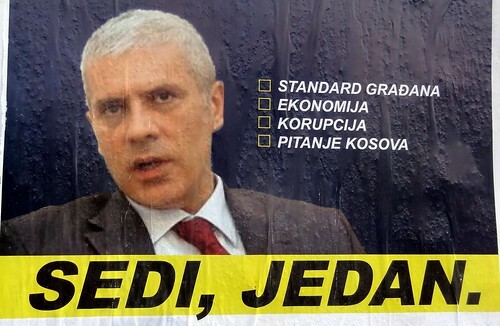 His slogan is “Honest and Successful Serbia” (Yes You Can?) – I need a bit of help with the translating. I see that Nikolić wants to portray himself as a job creator and not corrupt.